This is a rare jewel of a movie. 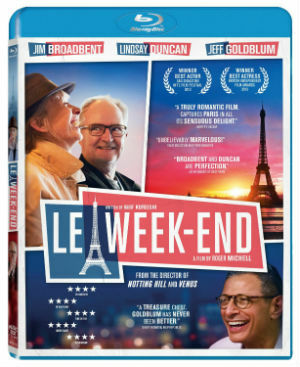 Le Week-End follows Nick and Meg, enacted brilliantly by Jim Broadbent and Lindsay Duncan, a British couple whose longtime marriage faces a turning point during a weekend in Paris. Directed judiciously by Roger Michell from an exquisite original screenplay by Hanif Kureishi, and photographed beautifully by Nathalie Durand, the film captures the nuances of a long-term relationship, the ups and downs, the easy asides and the sidelong glances, the heat of anger and the warmth of touch, the regrets and the resentments and the recriminations. It begins, comfortably enough, on a train but soon enough becomes awkward when Meg doesn't like the tiny hotel room Nick has secured for them. ("It's beige," she says, petulantly, and storms out.) She hops into a taxi -- Nick almost getting left behind -- and tips the driver to go faster. On cue, the discreetly flavorful jazz score by Jeremy Sams kicks in, and the pendulum of their relationship is set in motion: Meg spies a luxury hotel and decides that's where they will stay, money no object; Nick is well-aware that their finances really don't allow that kind of extravagance. Meg, the free spirit; Nick, the worry-wart. It doesn't play out quite that simply, which is the key to the movie's accomplishment. The two dance back and forth, in love but not quite sure if they still love one another, or if, instead, it's time to quit the whole thing and go do something else. The compressed time-frame enforces a contrived yet rigorous focus that keeps the emotions churning as the hours tick by. Meeting up with Morgan (Jeff Goldblum), an old chum of Nick's, on the street is equally contrived, yet again is marvelously useful in channeling the couple's energy on the dinner party to which Morgan invites them. Morgan has become a successful writer and serves as a linchpin for Nick and Meg to make a momentous decision. Fresh and authentic, comic and dramatic, Le Week-End speeds through the history of a relationship without resorting to flashbacks, instead displaying the effects of the passage of time on two people and how they get along. Relationships aren't easy, but good movies about them are much harder to create, which is why I consider Le Week-End a jewel to be treasured. Released on Blu-ray, DVD, and VOD by Music Box Films this week, this is definitely a film worth seeking out. The Blu-ray edition features a wonderfully detailed picture and an English 5.1 DTS HD Master Audio soundtrack that is more than adequate. An audio commentary by director Roger Michell and producer Kevin Loader is packed with information about every scene. The filmmakers are complimentary to the actors and crew members, without being unduly effusive about it, and explain how they were able to shoot in Paris on a small budget with a tiny crew. They also talk about the challenges of capturing those 'relationship nuances' I reference above. It's a good listen. Just shy of 16 minutes, the making of featurette features Michell and Loader, as well as writer Kureishi and actors Broadbent, Duncan, and Goldblum. It's a good, tight video, that covers all the bases needed for such a promotional feature. Nineteen illustrations by "artist in residence" Jane Webster are included. She was present on set for rehearsals and then during production, so she captures a good variety of images. "How to Dance 'The Madison'" is an instructional video about a dance performed in the movie, which was inspired by an iconic scene in Jean-Luc Godard's Band of Outsiders. Overall, it's a good home video package for a fine film. If you're hesitant about replay value, then by all means rent the movie; it's a bargain at any price.